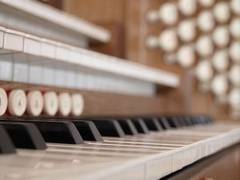 When John Makin Pilling acquired the electronics division of Compton Organs Ltd in 1970, his vision was to reproduce the grand sonorous sound of an English Church or Cathedral organ. Over the years, Makin achieved impressive results in both their standard production or custom-design range. After the death of Mr Pilling, Johannus President, Mr Gert van de Weerd, acquired Makin Organs. The two owners of the firms had been friendly for many years and even shared techology and manufacturing resources, so this was a logical step. Today Makin Organs remains totally independent and true to Mr Pilling's dream. Every Makin organ is made to order. Imagine of having the flexibility to choose your own stop list or choose a recommended stop list for your size organ. From the drawing board to your fingertips!